What do unruly rubber plants, sulking evergreens and intergalactic colonisation by plants have in common? 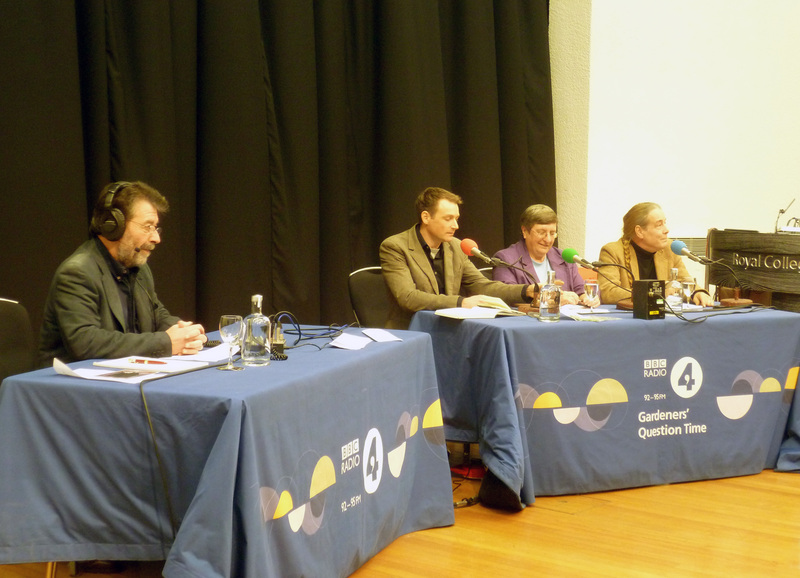 They were all questions to a panel of horticultural experts on BBC Radio 4 Gardeners’ Question Time. The show was recorded beside Regent’s Park on Monday 23 January and featured practical advice about gardening served with inspiring ideas and sparkling banter. I went to the show with Emily, although first we enjoyed the host’s drinks and canapés. 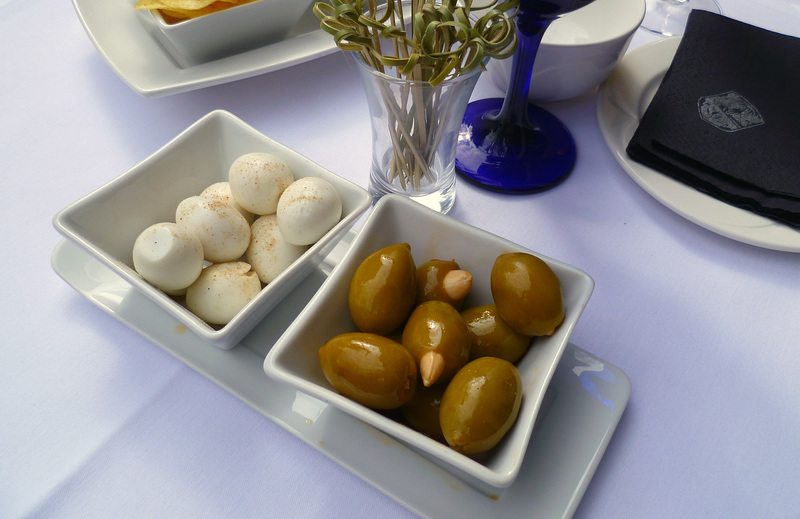 After sampling a quail egg, Emily was left to ponder how you go about eating more of these delicious mini foods. Filled with quail eggs, stuffed green olives and cheese straws, we made our way to the recording in the Wolfson Theatre. The programme was presented by Eric Robson with a group of gardening experts, Chris Beardshaw, Bob Flowerdew and Christine Walkden. The panel answered a variety of questions from what to do about a rubber plant that was growing like a hooligan (some clever pruning) to how to grow a vertical garden (involving a peashooter). My favourite question was ‘What plant would you take to another planet?’ As an aromatherapist and beekeeper, I have often thought a packet of garden seeds and a nuc of bees essential to terraforming another world. If I could choose only one plant it would be lavender, because it is the most versatile herb and essential oil, and bees love it. Lavender is also a friendly plant and least likely to mutate into a triffid. From alien plants to disappearing bees, there was a sad discovery at the apiary this Saturday. 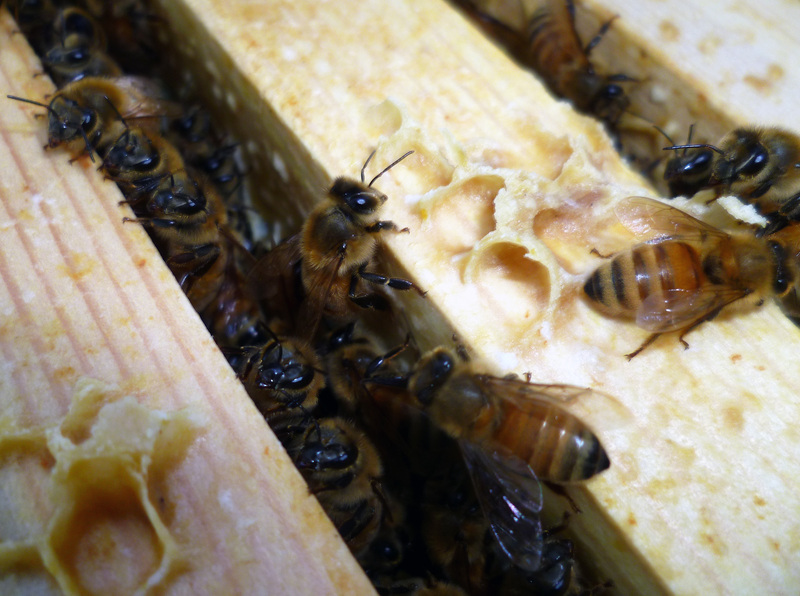 A hive belonging to one of the beekeepers was found mostly empty with little dead bodies frozen on the comb. It looked like the colony had succumbed to varroa as the mite count had risen sharply in January. This is a common problem for winter bees who are more susceptible to varroa. As the colony grew smaller they would have been unable to keep each other warm and the remaining stragglers probably froze to death. We also found newly hatched bees dead in the cells because there were no nurse bees to feed them. There was plenty of uneaten honey leftover that could be harvested for marmalade and mead. However, in a strange turn of events another beekeeper reported that his colony had almost doubled in size and, unlike his black bees, the new bees were light coloured. So we suspect that many of the golden Italian bees from the dying colony had absconded and bribed their way with honey into a new home. It was nice to think that the collapsed hive was enjoying a second life. Did these light-coloured Italian bees find a secret second life in the hive across the path? Eric Robson chairs a programme of BBC Gardener’s Question Time from the Royal College of Physicians beside Regent’s Park, London, with Chris Beardshaw, Bob Flowerdew and Christine Walkden on the panel. To find out more about BBC Gardeners’ Question Time visit the website. Read more about how to live with lavender (not on Mars). 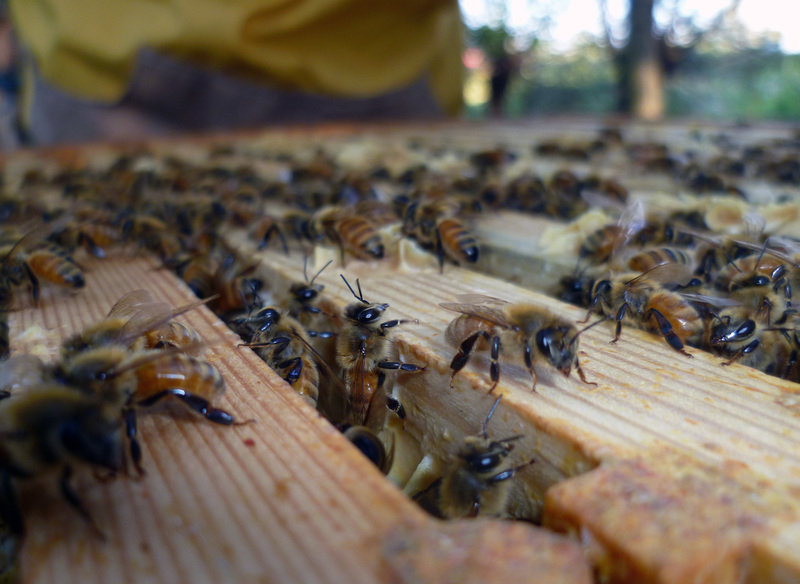 Beebase have lots of advice for beekeepers on how to manage varroa. This entry was posted in Beekeeping, Gardens and tagged BBC Radio 4, beekeeping, bees, Bob Flowerdew, Chris Beardshaw, Christine Walkden, Eric Robson, Gardeners Question Time, lavender, linkedin, varroa by Emma Maund. Bookmark the permalink. I like your blog! My Dad was trained as a beekeeper in school and we always had a few hives in the garden at home, so they are quite familiar to me. That said, my mum developed a severe anaphylactic reaction to their sting (I used to find her passed out cold around the place if one got her, and she got a rash all over) and since it was her who was mainly left to mow the lawn, unsurprisingly, the bees now live elsewhere. How lovely to grow up with bees in the back of the garden, although I understand why your mum might want her lawn back! Can you remember the taste of your bees’ honey? The decline of honeybees is a combination of many complicated factors, but I am sure pesticides are not helpful to pollinators. Fingers crossed 2012 is a good year for bees! Very interesting blog,.Bees are so valuable .Noticed Christine Walken in the quiz line up .Her programme on BBC was informative about gardening and so funny .I never missed it ! I’m trying to do a garden blog about my garden & gardening on clay soil-just started last week -not much to read yet ! Christine was brilliant and shared her adventures hunting for exotic plants, I think you’ll enjoy. Reminds me why I need to buy a digital radio. There was lots of advice on the show about growing in different soils too. Good luck with your gardening blog – gardeners and beekeepers should stick together! Yes: it was extremely dark, treacly honey, a very intense, flowery, honeyish flavour, not like that acacia fake rubbish you get in the supermarket. Sort of like tree sap, it was so thick. We collected jars of it, and had so much we couldn’t finish it all. I remember the remainder sort of crystallized before we could get to it. I also have fond memories of being trapped inside the house while a new queen would swarm the garden, such an event! What wonderful memories – fresh honey from the comb tastes so much better than that super-processed supermarket stuff. Our honey was treacly too and we wondered if our bees had been hobnobbing on heather. Wow, swarms in the garden – that must have been an amazing event. It was an encounter with a swarm that led me to become a beekeeper.